It’s not a task traditionally identified with the words “enjoyable” or “exciting.” But in its peculiar way, doing laundry can actually be relaxing. You can throw in a bit of enjoyment by putting on upbeat music as you sort laundry or squeeze in some excitement by incorporating a bit of parkour as you throw clothes into the washing machine. Whether you want to meditate or break out into a gymnastic move while doing laundry, the point is you need clean and dry clothes so it’s a task you cannot avoid. Most homes may be equipped with a washer and dryer. Both machines can add considerably to your energy bills, and even damage some of your more delicate clothes. The good news is that you can cut back on energy costs and maintain the shape and quality of your clothes by using a ceiling mounted clothes airer instead of a tumble dryer. Here are four reasons to choose the six lath ceiling airer. 1.You can dry your clothes — even in stormy weather. Line drying clothes can be problematic in bad weather. You never know when you have to run out to your backyard and grab your laundry off the rack when it starts to rain. A ceiling mounted airer would be the ideal solution, and with six laths you gain more drying space between clothes so you can hang thicker items like towels. You can install your six lath airer anywhere in your house or out in your covered balcony or terrace. Whether you’re experiencing damper winter months or rainy days, your clothes will be dried, good and proper. 2. You gain more space with a ceiling mounted airer. When you live in a smaller flat or house, with no outdoor area, you’ll need all the space you can get. By choosing a ceiling mounted airer, you get to utilise the indoor warmth of your home to dry your clothes without having to sacrifice a square footage of it to do so. 3.You can choose from a range of colours and sizes to suit your home. You can go for black or brass if your home’s interior is more classic. You can go for white or ivory if your apartment’s interior is minimalist. You can go for red if your loft is hip and contemporary. You may also choose a size that can hold the volume of laundry you need to dry. 4. The ceiling airer is very versatile. 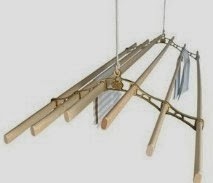 You can get creative and use the ceiling mounted six lath airer for another purpose, other than to dry laundry. You could hang decorations for the holidays (nothing too heavy, though), maybe dry bundled up aromatic herbs, or use it as a centre piece for a romantic evening with your beloved by dangling dreamy lights. About the author: Kenneth Lawrence loves to write home improvement DIY tips to help lots of home owners out there. He even provide tips on what certain things to buy in order to ease a homeowners job or chores. He writes in behalf of http://www.lifestyleclotheslines.com.au/ .